Motorola is expected to launch its Moto E5 lineup, including the Moto E5 Plus on April 3. 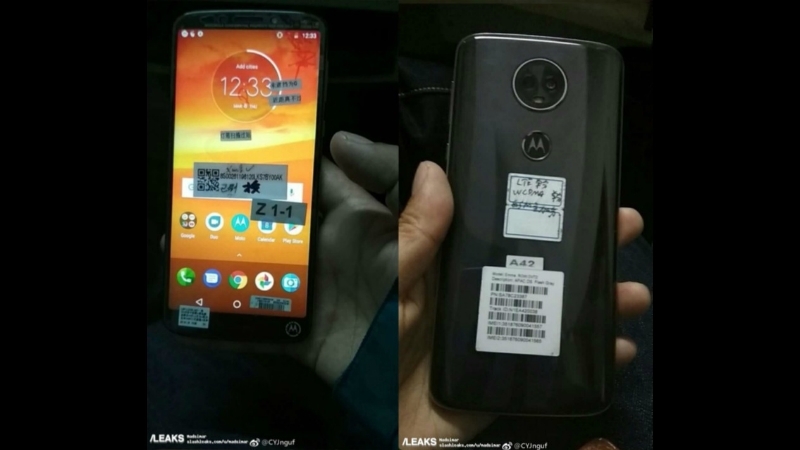 Today, one of the Moto E5 lineup smartphones, the Moto E5 Plus has been leaked online in live pictures. The pictures are detailed enough to understand the design of the smartphone, it confirms most of the rumors about the design of the smartphone which surfaced before online. The Moto E5 Plus from Motorola will feature an 18:9 aspect ratio display which will have thinner bezels compared to the previous Motorola smartphones. There will be a dual camera at the back with the same orientation as we saw on the Moto X4. Now, let’s take a quick look at the pictures of the Moto E5 Plus which recently got leaked online. The image shows the Moto E5 Plus with an 18:9 display at the front, the size of the display might be a 5.8 inches and will have a resolution of 720 x 1440 pixels. Evan Blass has leaked a render of the smartphone which shows the dual camera setup but he claimed that there won’t be any secondary camera on Moto E5 Plus and it will feature a single shooter. In the leaked pictures, we can easily see that the smartphone features a dual camera setup with LED flash and below the camera is a fingerprint sensor with Motorola branding on it. The pictures also show that the smartphone will feature a glossy back, however, we are still not clear if it is a glass panel or not. The images didn’t reveal the connectivity options or the hardware specs but according to the rumors, the smartphone will feature a quad-core processor with a massive 5,000mAh battery. The whole Moto E5 series is expected to launch on April 3 along with the Moto G6 series.